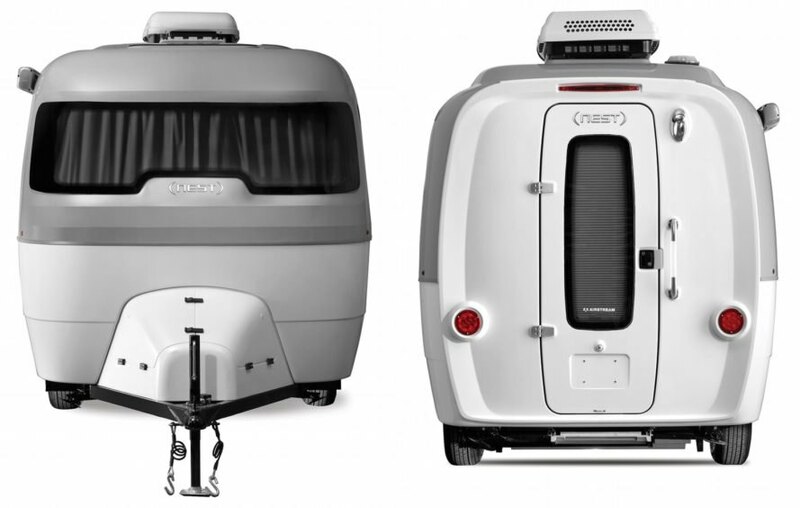 The makers of the iconic “silver bullet” travel trailer just launched their highly anticipated Nest travel trailer – and it’s unlike any Airstream you’ve ever seen before. Designed as a home away from home, the Nest is big on comfort and amenities but also resilient and easy to tow — making it the ideal adventure camper. 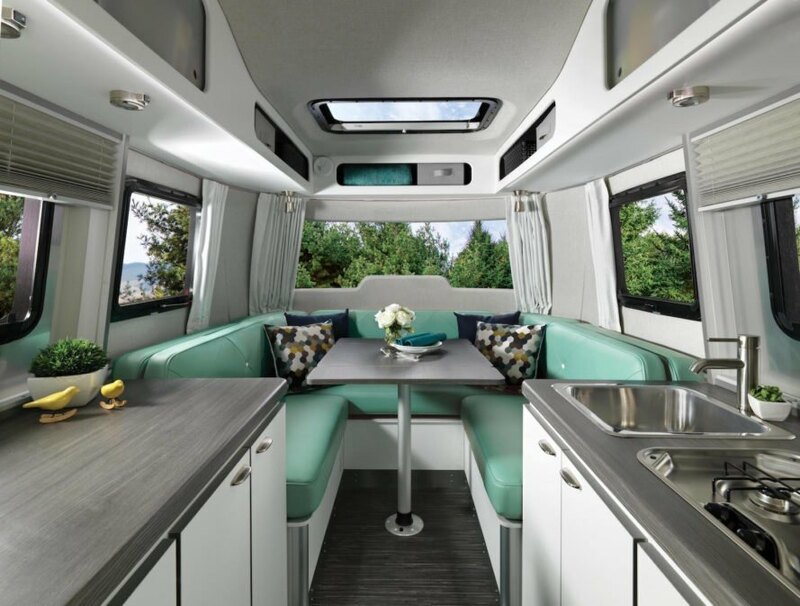 Airstream’s newest trailer also marks the company’s first departure from aluminum for the world of lightweight fiberglass – and it’s available starting at $45,000. Nest offers more than just winning good looks. Created by designer Robert Johans, who was also involved in Airstream’s in-house development, Nest blends form and function in an aerodynamic semi-monocoque structure. Ski goggles inspired the shape of the wide and slightly rounded front windshield, while five additional tempered tinted windows, a skylight, and a vertical window on the doorway come together to create a nearly panoramic view and flood the interior with natural light. Space-saving techniques create a sense of roominess inside the 16-foot, 3,400-pound Nest, which manages to pack a surprising number of amenities into its sleek and minimalist interior. When the rear doorway is opened, the eye is immediately drawn to the cozy living area and views beyond the front windshield. The bathroom and storage immediately flank the entrance, followed by a galley kitchen with a two-burner stove, sink, fridge, and microwave, and finally by the primary living space in the back. Customers can choose between two floor plans: one with a U-shaped dinette that converts into a queen bed, and another that features a permanent queen bed with a plush Tuft & Needle mattress. “There’s really nothing else like it,” said Airstream President & CEO Bob Wheeler. 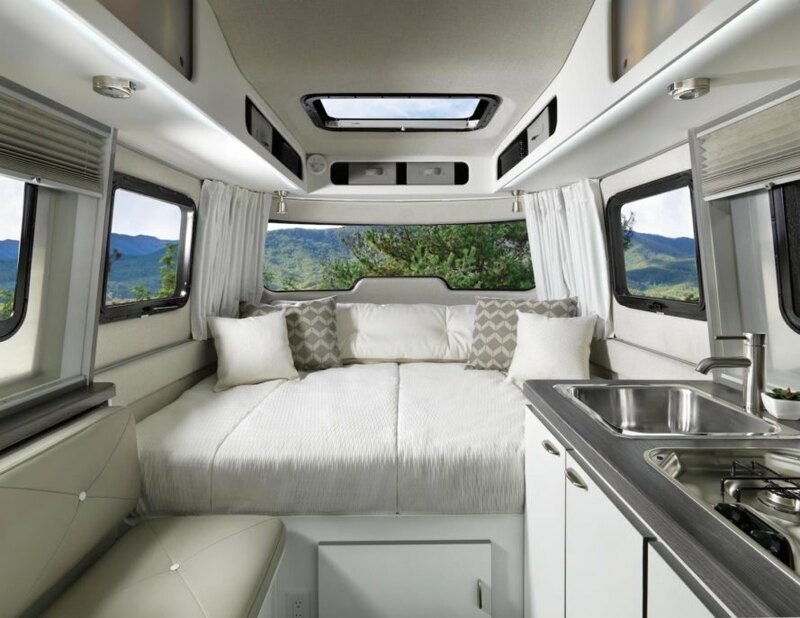 “Nest acknowledges Airstream’s lasting legacy, while anticipating a new potential for outdoor adventure.” Airstream’s Nest is priced from $45,000 MSRP and will be sent to Airstream dealers nationwide this month. I've been doing research on fiberglass rv's for the last 2 years. Recently i purchased a lightly used 13' scamp, its very simple yet effective and it has all the of benefits of a fiberglass rv while weighing in under 2000lb with a 150lb hitch weight. I like airstreams, but the prices are out of this world. At that price point, for the average joe like me, an airstream may as well be an earthroamer. 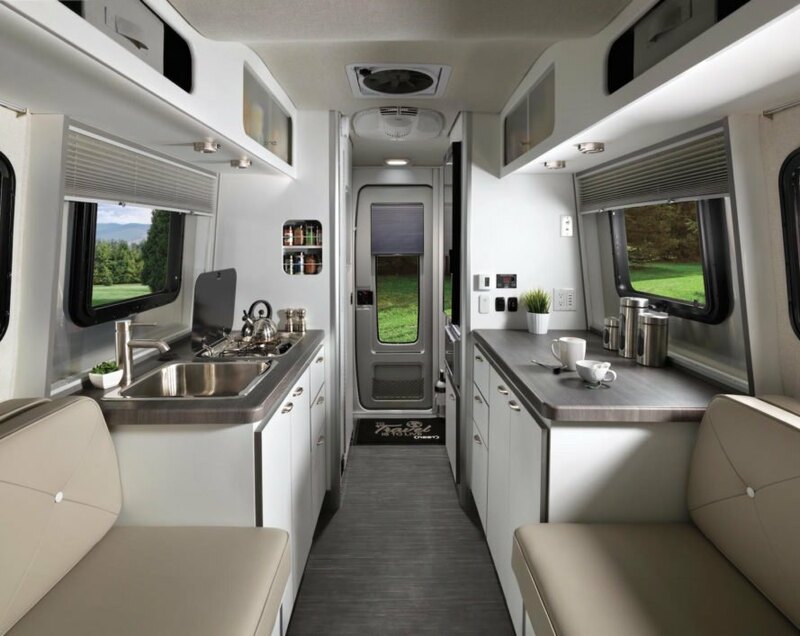 The makers of the iconic “silver bullet” travel trailer have just launched Nest, their highly anticipated Airstream that’s unlike any you’ve ever seen before. 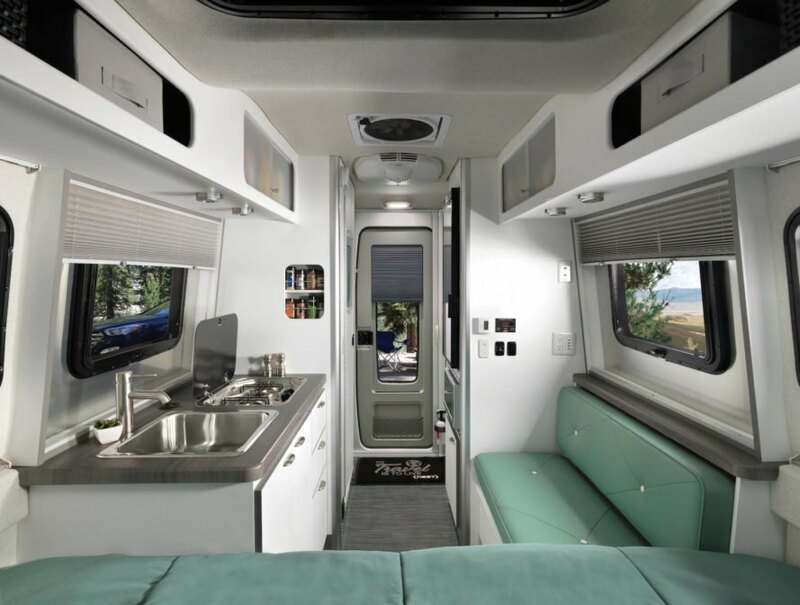 Designed as a home away from home, the modern Nest camper is big on comfort and amenities but also resilient and easy to tow—making it the ideal adventure camper. 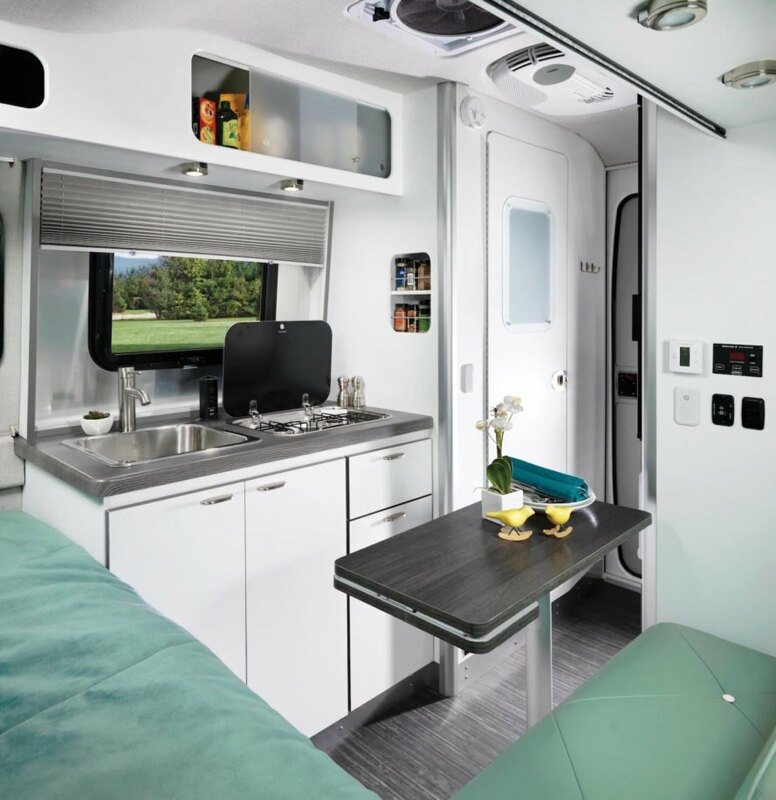 Airstream’s newest addition to the family is also an innovative one and marks the company’s first departure from aluminum for the world of lightweight fiberglass. Originally created by designer Robert Johans, who was also involved in Airstream’s in-house development, Nest blends form and function in a semi-monocoque structure. Ski goggles inspired the shape of the wide and slightly rounded front windshield, while five additional tempered tinted windows, a skylight, and a vertical window on the doorway come together to create a nearly panoramic view and flood the interior with natural light. Space-saving techniques create a sense of roominess inside the 16-foot, 3,400-pound Nest, which manages to pack a surprising number of amenities into its sleek and minimalist interior. When the rear doorway is opened, the eye is immediately drawn to the cozy living area and outdoor views through the front windshield. The bathroom and storage immediately flank the entrance followed by a galley kitchen with a two-burner stove, sink, fridge, and microwave, and finally by the primary living space in the back. Customers can choose between two floor plans: one with a U-shaped dinette that converts into a queen bed, and another that features a permanent queen bed with a plush Tuft & Needle mattress. 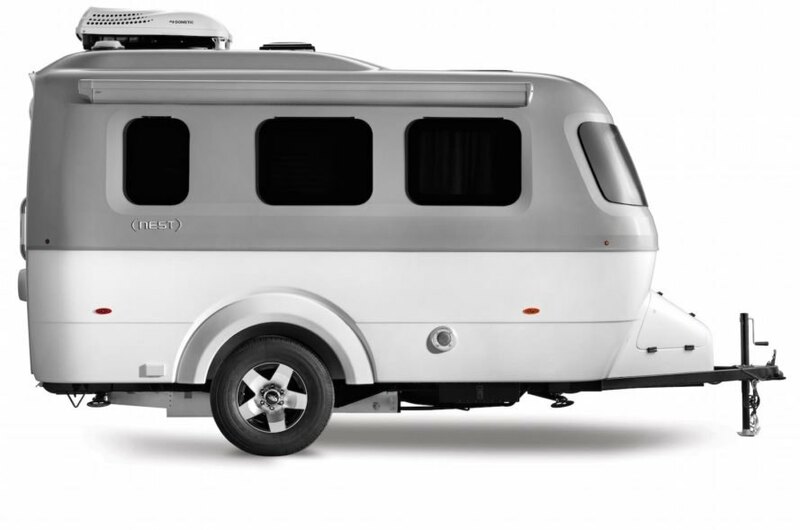 The makers of the iconic “silver bullet” travel trailer just launched their highly anticipated Nest travel trailer - and it’s unlike any Airstream you’ve ever seen before. Designed as a home away from home, the Nest is big on comfort and amenities but also resilient and easy to tow — making it the ideal adventure camper. Airstream’s newest trailer also marks the company’s first departure from aluminum for the world of lightweight fiberglass - and it's available starting at $45,000.